Around Easter time, you may see children, as well as adults, running after each other with colored eggs in their hands, which then explode into confetti when they hit their desired target. These are called cascarones, or “confetti eggs”. The idea was first seen in Asia and later brought to Italy by the explorer Marco Polo. The eggs were often given as gifts and were filled with perfumed powder. The custom then traveled to Spain and was later brought to Mexico in the mid-1800s by Emperor Maximilian’s wife. It was in Mexico that the perfumed powder was replaced with confetti. The word cascaron comes from the Spanish word “cascara”, which means egg shell. In interior Mexico, one often sees these colored eggs thrown at fiestas during carnaval, just before lent. While you may see cascarones at the carnaval celebrations in the US, it is more common to see them around Easter. This is because, like many other Latin traditions, there has been a merging with the US holiday tradition of dyeing hard boiled eggs. Having one broken over your head is said to bring good luck. To make cascarones, first open just the top of an egg. One trick is to tap the top (the small end) of the egg on a sharp corner. You can also make a small hole on the end using a pin, a small nail, or a knife. You want to keep the hole small so that the egg is sturdier. Next, drain the egg into a bowl so that you can use the eggs later in a meal, such as migas or flan. Next, rinse out the inside of the egg. 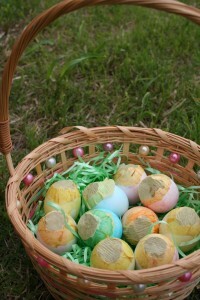 Once the eggs have dried, you can decorate them using egg dye, water colors, or paint. When the dye or paint is dry, fill the inside with confetti. Finally, close the opening by placing glue around the edges and placing a small square of tissue paper over the hole. Wait until the glue has dried before smacking the cascarone on an unsuspecting person.